Many people who stutter, do not when they sing, shout, whisper, swear or choral speak. 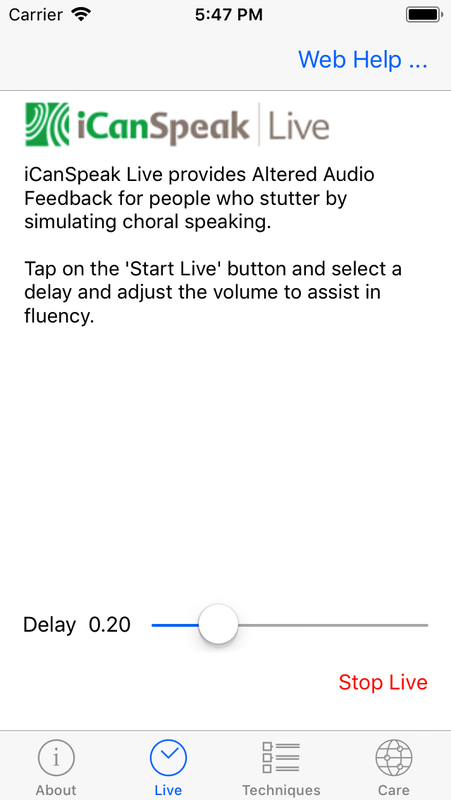 iCanSpeak Live emulates choral speaking by using the mic on a set of headphones to capture the voice of the user, delay it slightly, and then replay the voice into the ear pieces of the headphones. Altered Audio Feedback (AAF) or Delayed Audio Feedback (DAF) is not a new concept, and has been around for decades, and many studies were done before smart phones allowed 'all day' usage. Version 2.1 with the Live module has been in testing in various forms since April 2017, and is available in Apple's App Store as a free download. iCanSpeak Live is intended to be used for longer durations (most of a day) by a user to assist in fluency. The app will run in background on an iPhone, and can run for multiple hours in a day. To maximize battery life it can be turned off during longer periods of time when the user will not be speaking. To use, START the Live module, touch on the START button in the lower left of the screen. The Altered Audio Feedback (AAF) will start up immediately, and a delay value and volume that assist in fluency. Live provides sliders to adjust the the delay from 1/10 of a second up to one full second. Experimentation on the part of the user can get a level that works best for each person. The STOP button will end the session, and reduce the battery requirements when not in use. The use of Live to provide Altered Audio Feedback (AAF) can be a confidence builder for someone who is struggling with fluency. A number of minutes with Live can create an atmosphere of confidence that can extend to other parts of a therapy session. In the Techniques module, exercises which encourage the use of stretch syllables, gentle onsets and full articulative motion will be available. These can be combined with Live in order to provide cues for fluency.